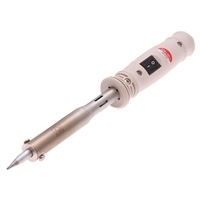 This professional grade soldering iron produces 80 watts (up to 500C) and is ideal for general purpose soldering applications including metal board, tube or large components, electrical/electronic components, audio equipment, RC hobbies and more. The round, soft grip, non-slip handle features an on/off switch and is designed to help relax the hand during extended use. Soldering iron features a long life replaceable fine tip and comes with a durable cord with a 5-foot reach.